Finally, a book that really does make running a daycare centre or family dayhome easier! 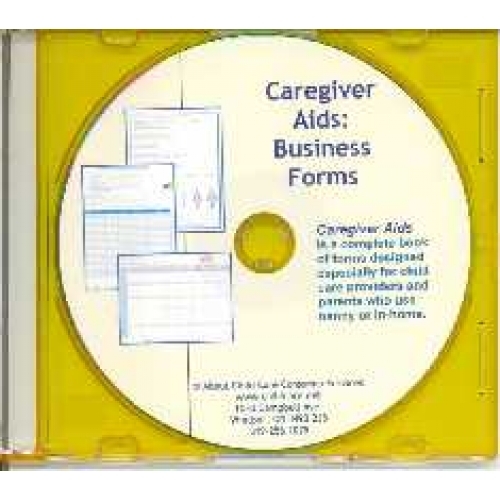 Caregiver Aids: Business Forms For Child Care Providers is a complete book of forms designed especially for child care providers and parents who use nanny or in-home care. No need to re-invent the wheel with this book. Forms are ready-to-use and easy to use. Some forms are master copies. All you have to do is copy them and begin to use them. Other forms only require that you add your letterhead or artwork. Best of all, they can be adapted to suit any child care operation. Order the CD today and start enjoying all the great resouces listed below. Not only do you get the book in electronic format, but you get each form in MSWord so you can customize it to match your business logo, colours, name, etc. Also available in instant download or soft cover format. Caregiver Aids: Business Forms For Child Care Providers is one book you should not be without if you run a dayhome, daycare centre, or have a nanny or in-home caregiver. See for yourself.